Summary: Designing and implementing a DSL with Java may result in a tedious and arduous experience given the limitations of the language. However there are a couple of techniques and tricks than can be applied to obtain better results. Hello again, it’s been a quiet period since the last issue due to summer break. The 7th edition of JCrete took place once more in mid July at the Orthodox Academy of Crete (OAC for short) in Kolimbari, Crete. Like every other unconference, JCrete offers the opportunity to every attendee to share their passion and knowledge, however JCrete is quite unique as you can experience the famous cretan hospitality, and well the setting (the beaches!) is beyond belief. This year I decided to take a different approach to the event and made a handful of interviews with the attendees as well as two of three founders: Dr. Heinz Kabutz and Kirk Pepperdine. You can watch all the interviews if you follow this link. There were over 90 different sessions held during the regular time, one in particular caught my attention which is the topic for this issue. The conversation started by sharing the motivation for the meeting then we jumped into the proper mechanics of writing a DSL. As is likely to happen when touching the subject the distinction between internal vs. external DSLs arose pretty early. An internal DSL is bound to the host platform/language, in other words it’s very close to the host and follows most of its rules. Think for example the Bean Shell Framework (BSF) which provides scripting capabilities on top of Java. On the other hand an external DSL is not bound to the host language, it can be a completely different type of language; users of this kind of DSL might not even be aware about the host at all. Given that external DSLs can be implemented with any existing platform/language we limited the options to just the JVM and internal DSLs. This trick is used by AssertJ/Truth (discussed in issue 002) in order to provide a fluent interface design to their assertion hierarchies. 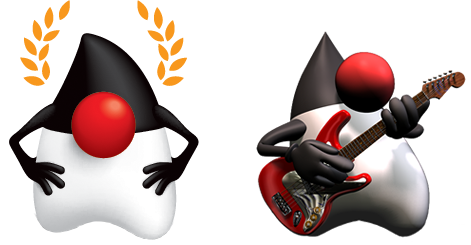 The next approaches require Java 8 as they rely on features added to Java on that release, namely default methods, lambda expressions and method references. Default methods let you define implementation details on an interface. While this feature does not directly affect the syntax of a target DSL it enables more code reuse as you can push common implementation details up the chain to an interface instead to an base class, thus giving you the freedom to extend any other class if needed. The syntax of lambda expressions may look alien in some DSLs but their power is unbeatable, as they can be used by the final users of the DSL to define inline functions; the alternative would be for them to define static methods and that would force them to have more knowledge of the Java language itself. Finally, method references can be seen as shortcuts for lambda expressions, and yes the syntax of receiver::function may also be seen as alien in some cases however there may be times where their usage leads to better results. One last point to rounding up the options discussed was the usage of the builder pattern. Often times the domain is expressed in terms of immutable objects which means you need a way to construct those immutable instances thus a mutable version of the target type is used: the builder. Implementing a builder is pretty straight forward but the code can be very verbose; you may use IDE macros as an alternative or Project Lombok’s @Builder annotation to get the same effect.